In October, SMIF’s Development Coordinator Alissa Blaha joined 24 community members from Blooming Prairie, Ellendale, and Medford at a Blandin Community Leadership Program (BCLP) retreat. Blandin Foundation’s mission is to strengthen rural Minnesota communities, and BCLP is just one way they do that. Here’s a Q & A with Alissa on her BCLP experience. 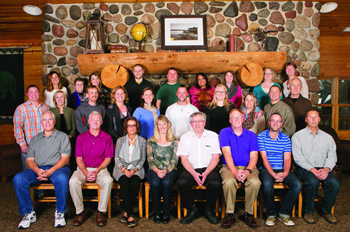 The Blandin Community Leadership Program is a week-long retreat designed to develop and sustain healthy community by building on community strengths. Up to 24 community leaders examine what a healthy community is; a place to live where all people can meet their economic, social, physical, cultural and spiritual needs, work together for the common good, and participate in creating their future. During the week long retreat, the group learns about how to work together, looking at existing strengths and assets to help fill the gaps and create a brighter future for their community. Who was in your leadership cohort? I attended the program with community members from Blooming Prairie, Ellendale and Medford. I feel very fortunate to attend when three communities were involved as attendees are typically from one community. The group was very diverse with people from the schools, local religious organizations, government folks, the typical go to people in the community who are involved in everything and those who would like to be more involved. A number of the attendees weren’t sure why they were selected or who viewed them as a leader. As the week progressed, we learned leaders come in many different forms and we all have something to contribute to make our communities healthier. What was your favorite part and biggest take-away? My favorite part about the retreat was watching people come together to make change in their community. Everyone was supportive of each other and willing to step out of their comfort zone to learn about new concepts to better not only our communities but also ourselves. My biggest take-away is everyone is different. We all learn differently, communicate differently, and interact differently. A true leader is able to take this into consideration when working with others and create a more inclusive environment which will lead to a healthier community. How has it changed how you think about your work? The Blandin Community Leadership Program is based on teaching three core competencies; framing, social capital and mobilization. All of these are needed to create positive effective change in a community. In my work with community foundations, we focus on creating a better tomorrow. Many communities have networks to tap and people willing to move into action to make change but we many times lack an effective hook to draw people in. This retreat has prompted me to use more time focused on framing statements, or creating shared meaning about issues affecting community health that influences action choices. This will set the community foundations up to be more successful in the future. Why would you recommend BCLP to others? This leadership retreat not only gives you tools to improve the health of your community but also provides many opportunities for personal and professional development. The skills learned will help in your work, volunteer opportunities and home life. This was truly one of the best opportunities I’ve ever had to improve all aspects of my life. If you have the opportunity to go, be prepared to eat a lot of amazing food! How can people learn more/apply with their community? 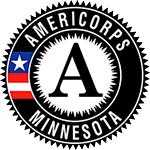 All rural Minnesota communities can apply, but there is a high demand for this training, with more applicants than available spots. View their FAQs or email Becky Adams at rmadams@blandinfoundation.org for more information. To learn more about Blandin Foundation, visit their website: www.blandinfoundation.org.